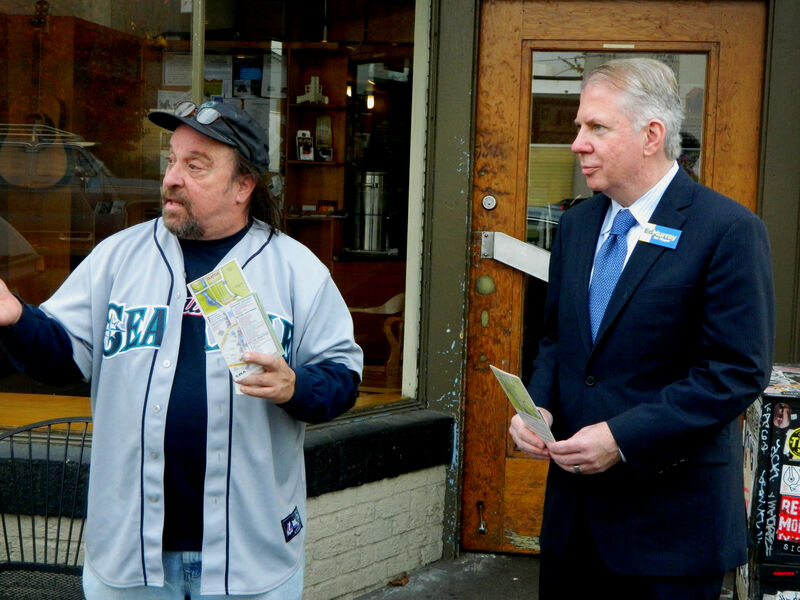 Fantagraphics curator Larry Reid gives Seattle Mayor Ed Murray a tour of Georgetown’s retail district along Airport Way. There they stood, two vastly different individuals representing opposite sects of Seattle. Ed Murray, the Capitol Hill senator in a pressed pinstripe suit, was just days away from being elected mayor. On this day, he was visiting Georgetown on a late campaign stop. His host was Larry Reid, the comic book store curator in a Mariners jersey, jeans and some old sneakers. Reid’s message: Georgetown is a neighborhood with great historical and social capital, one with an expanding retail scene that’s following a reputable arts community. So, please, don’t forget about us. Reid, the curator of Fantagraphics Bookstore & Gallery and a member of the Georgetown Merchants Association, wasn’t just trying to show Murray that Georgetown is a hip and promising neighborhood — Seattle’s new mayor has plenty of those to deal with as is. Rather, Reid was pointing out how Georgetown has some unique needs if it is to survive as a retail player, and he brought up some oft-overlooked points. On the map, Georgetown is part of Seattle proper; in reality, it is a small town all its own. Around 1,200 people live in the area, which is separated from its neighbors by unmistakable barriers: a railroad to the north and east, an airport to the south, and a polluted-beyond-belief river to the west. Such barricades have turned Georgetown into an urban island that is clearly distinguishable from neighbors SoDo, Tukwila and South Park. For much of its history, money was made in the industrial sector and spent on drugs and hookers. Ten years ago, Georgetown was filled with empty warehouses and storefronts. Crime was pervasive. The glut of cheap space made the neighborhood a destination for artists, who mingled nicely with Georgetown’s industrial crowd to form a unique arts scene. Riding those coattails is a retail and culinary district featuring shops like such as Fantagraphics, 9 lb. Hammer and its contingent of sister bars, and restaurants such as Brass Tacks. Because of its odd geography, Reid says unique shops and well-known restaurants are the only thing that will keep Georgetown from slipping back to its former polluted, crime-ridden status. Supporting Georgetown’s business district can’t be done with the same development tools that are used in other areas of Seattle. The presence of Boeing Field limits building heights, so mixed-use apartments and high-rise condos aren’t a viable option to expand retail options or the consumer base. Furthermore, transit systems have largely neglected Georgetown. The Link light rail line skirts around the neighborhood, and bus options from northern neighborhoods are limited. Since Georgetown doesn’t have much room for residential growth and transit options are at a minimum, Reid and other merchants need consumers to come to from other neighborhoods, and those consumers will likely be driving their cars. The characteristics of the neighborhood form a dichotomy. Georgetown’s character is one of its greatest assets — it’s got a rough-hewn vibe that stems from the industrial roots and outlaw past, and that attitude has melded nicely with the creative class that has migrated to the area. The retail district is a source of pride for Georgetown residents, but locals alone can’t support all the shops and eateries popping up. Thus, outsiders and their dollars need to come in, but that could compromise Georgetown’s unique personality. This is where Murray’s decisions might play a role, as the retail sector needs to be accommodated but residents can’t be priced out by the amenities that accompany retail success. Seattle’s wealth is spreading, and Georgetown could see an identity crisis brought on by affluence. It wants the perks of a successful retail district — wealth, clean streets, guests’ dollars — without losing its arts scene and industrial backbone. Reid’s Georgetown wants the vibrancy of Murray’s Capitol Hill without the density and hipster culture. If the suits in Murray’s office and the Mariners jerseys in storefronts both strike a balance in Georgetown, a sustainable business district could be the result. Previous Will Ballard’s Brewery Bubble Burst?